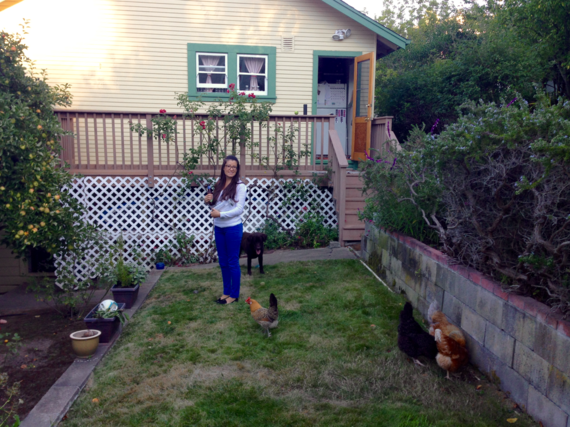 My son Alex and his girlfriend Natalie have been raising chickens in their backyard for the past five years. So I know that depending on the breed of the hen, the color of a farm (backyard) fresh egg can naturally be white, brown, blue or even green. Alex has also taught me the colors of the egg says a lot. Eggs that are the freshest and most full of nutrients will have a bright orange and plump yolk with perfectly clear whites, while those that are not will be a pale yellow with dull, speckled whites. With such inside information and access to the freshest eggs possible, you would think I wouldn’t have needed the egg-ucation I received when my friend Charli and her adorable ten-month-old baby Vivien came to visit me. We were in the kitchen, and I was preparing breakfast. At her direction, I carefully separated the yolk from the whites. 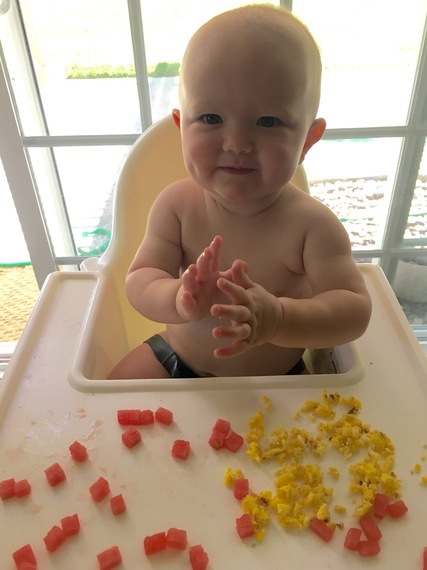 Apparently, the newest research advises that a baby not eat the egg white until they are at least a year old. While the egg yolk is loaded with nutrients, the egg white is a source of allergens. Cage-free and free-range might sound like the hens are free to roam but that is not necessarily so. Instead of cages, many are kept in multi-level aviaries which might allow them to spread their wings but hardly roam free. This label also does not preclude the use of antibiotics in feeding. In addition, these types of houses are much more expensive – a cost that gets passed on to the consumer. The USDA defines free-range or free-roaming as, “Producers must demonstrate to the Agency that the poultry has been allowed access to the outside.” Little information is provided about living conditions, (stocking density) and standard industry practices which keeps the consumer and chickens in the dark, literally. Brown rice might be better for us than white rice, but not so with eggs. The color of the eggs, as I already knew, depends on the breed of the hen. How nutritious the egg depends on what the hens are fed and how they are raised. The USDA has created guidelines for Organic Certification so if a food product is not labeled as certified the word organic is open for interpretation. In the case of eggs, in order to meet the USDA Organic certification they must come “from uncaged hens, free to roam in their houses and have access to the outdoors.” They should also be “fed an organic diet of feed produced without conventional pesticides or fertilizers.” What I learned is that the tricky part here is how “access to the outdoors” is interpreted. By the end of my egg-ucation, Charli had convinced me that the freshest, healthiest eggs came from hens raised in the most humane of conditions; such as from backyards like my son Alex and Natalie’s, and local small farmers, but when those are not an option, reach for pasture-raised. According to a study by Mother Earth News, pasture-raised are the only truly free-range eggs available and also the most healthful with one-third less cholesterol, one-quarter less saturated fat, two-thirds more vitamin A, twice as many omega-3 fatty acids, three times as much Vitamin E and seven times as much beta-carotene as commercial eggs! What I think is the most important part of the lessons Charli taught me about the best kinds of eggs to buy is that even when we are reading labels. As I grew my company Greenopia, I became acquainted with the term LOHAS, which stands for Lifestyle of Health and Sustainability. This market which includes brands, products and services from organic food to fuel efficient cars is now estimated to be over $209 billion in the US alone. It’s understandable that many people want to tap into that. I also learned of a rather deceptive practice known as greenwashing – in which a consumer will be led to think the product or service is truly green, but when you look deeper into it – as in the case of cage-free eggs – that is not the case. So it’s about more than reading labels. It’s about being a conscious consumer and educating yourself, so you know what the labels mean – whether it’s from some of my favorite resources like EWG, TreeHugger, and Mother Nature Network or good friends like Charli whose only vested interest is in raising a healthy, toxin free child. The key is always to be living with a green heart – especially in our own kitchen.